the8drivehunterman has no other items for sale. Sales tax may apply when shipping to: CA*(9.0%), IA*, MN*, NJ*(7.0%), WA*. Thank you. Fast ship. Just as described. Item was poorly packaged, if you can ever call what it was sent in "packaging." 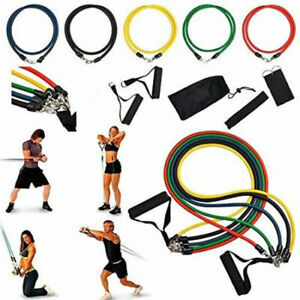 The bands and accessories are all very good products which have been a perfect addition to my workout routine. I am 78 years-old, even though I work out on a regular basis with weight machines, I have begun to notice some change in my muscle mass. The workout coordinator at our gym recommended the use of workout bands as an addition to my regimen. The bands are just what I may have needed and they appear to be of very good quality. One comment is that the travel bag provided is of questionable quality. It is made of some fairly flimsy netting and began showing wear very soon after I began using the bands. The bag began tearing at the seam and I had to find a replacement bag. It is not the solid material as shown in the photo. Purchased these bands a few weeks ago. Found them to be thin requiring to use three bands at the same time to increase the resistance. Clasps on the ends are small, making it hard to attach. There was no instruction for helping you get started with an exercise routine. For the money it's OK. These might work OK for a small light weight person who does not want to push themselves a little. I have another set I picked up at Wall Mart for $15.00 and it was far superior, only requiring 1 band to get the same resistance. I work out every day, so I need something that will last. Based on the construction of these I don't think they will last very long. This is a complete kit. It has all you need. Very versatile, use one band or double up for various resistance. Seems very well made. As a senior citizen, exercising can be difficult because of physical limitations. I purchased these bands to keep my muscles limber and that's what they do. I like being able to use them in my own home, any time I want to. They are a good purchase for anyone, but especially for home-bound individuals. Thank you.